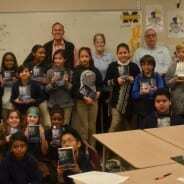 Phoebe and Barry Patterson of RNB Flooring were pleased to help distribute dictionaries to deserving fifth graders recently. Each student’s name was inscribed in the dictionary they received. The smiles were contagious and the students proud to have a new educational resource of their own. RNB Flooring was very pleased to join with our local Rotary100 club to provide a brand new dance floor for Hamilton High School in Chandler, AZ. Adam Vargas was the installer. Can’t stop those dancing feet!